I have a table with polygons that I wish to display in a map. I would like the smaller polygons to appear on top of larger polygons. Is there a way to set the drawing order such that the larger polygon outlines don't cover up the smaller ones? I've tried using the polygon area attribute as a transparency factor within the layer's symbology properties - but this is not working well enough. Since you already have a field carrying the area, just use the Sort tool, and use the area field with the 'DESCENDING' option. Note: The Sort tool requires an advanced license. You could add a new field called Size, and then field calc either Small or Large into the new field. Then symbolize by Unique Values based on the Size field. Then go into Advanced --> Symbol Levels and make sure the Draw this layer using symbol levels specified below is checked, and that the Small label is above the Large label. However you choose to do it, what you're looking for is the Symbol Levels option. If these are gdb feature classes, another option would be to use a Definition Query that is based on the SHAPE_AREA field. Just right-click on the layer in the TOC and copy and paste it. Place the new layer on top of the old layer, and in the new layer add a definition query that will filter out any features that are bigger than ____. Now you have the smaller features on top of the larger features. Not the answer you're looking for? Browse other questions tagged arcgis-desktop polygon symbology map-drawing draw-order or ask your own question. what dictates the drawing order of overlapping features with in the same layer/feature class in ArcGIS? How to permanently sort attribute table records without new output? Offsetting symbology position in ArcGIS Desktop? 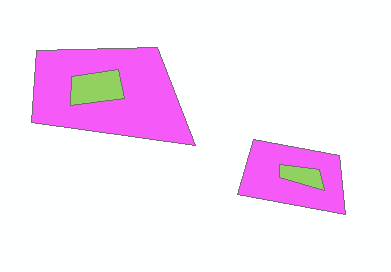 Split polygon by area using ArcGIS for Desktop (or QGIS)?